APRIL 29, 2018. 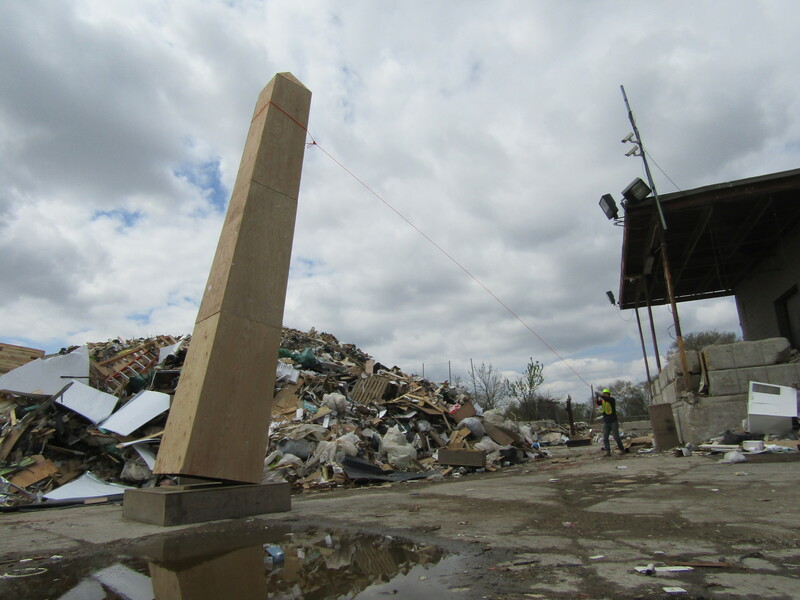 On the grounds of a recycling facility in northeast Philadelphia, artist Lewis Colburn completed his six-week program at the Recycled Artist in Residency (RAIR) by staging the destruction of an obelisk he built out of repurposed materials. The obelisk is a part of a series of works generated at RAIR titled Disposable Monuments. 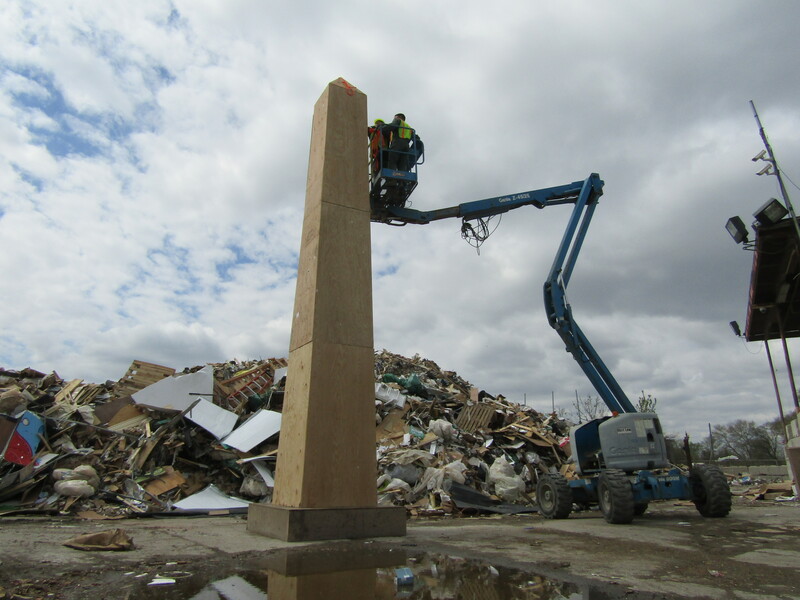 Amid irregular paths bound by mounds of recycled materials, a 26’ obelisk constructed of ¼” plywood lay on the ground at the edge of a large trash pile. There, the obelisk awaited its short-lived moment of freestanding glory before a towering wall of recycled materials. At first, the trash heaps seemed like a general mass of homogenized hue and form. Bright colors and descriptive shapes emerged, like purple from a Mummers Parade float, and framed the obelisk’s limp horizontal shape. Although hoisting the obelisk took some time and the skillful collaborative efforts of RAIR co-founder and Director of Residences Billy Dufala and Residency Coordinator Theo Mullen (both artists as well), the act of demolition—the anticipation, the clamor, the aftermath—was the focus. Loosely inspired, Colburn acknowledged, by the recent removal of Confederate statues and the ensuing protests, the obelisk metaphorically underscored the fragile state of venerated objects. Colburn was, he wrote, initially drawn to the “potent visual weight [of] the already significant gesture of removal,” remarking that he was astonished by the ease with which one of the Confederate monuments fell when protesters pulled it from its pedestal. Witnessing the collapse of the obelisk at RAIR, I, too, was interested as to how a rather effortless motion could render a seemingly significant structure useless, deactivating its stability, its narrative, its power. Initially erected in Ancient Egypt, obelisks remain visible markers in urban vistas. The Luxor Obelisk and the Washington Monument, for instance, rise above the Place de la Concorde in Paris and the National Mall in Washington DC. In their respective city thoroughfares, the slim stone obelisks pierce an otherwise clear sightline and support an architectural narrative of civic order, cultural pride, and national legacies. Colburn’s obelisk, however, diverges from this tradition in both its thin plywood façade and its location. An artist at RAIR, Colburn said, responds to what appears in the tipping yard—where dump trucks pull in to tip their cargo. Artists salvaging do not have a lot of time to think about what to save as the yard is a functioning industrial site. The materials are unpredictable as well, but luckily, Colburn recalled, a truck arrived with enough ¼” plywood to build the obelisk. Constructed of large rectangular plywood sheets, the obelisk had seams that ran through its width, segmenting the typically smooth finish and calling attention to its prefabricated materials. Subtle inconsistencies in color and texture visually connected the composite wood to the mishmash of remnants in the tipping yard. The second-hand nature of the materials belied a sense permanence, set it apart from its stone ancestors, and brought it into direct dialog with the commonplace cast-offs from the surrounding neighborhoods. The placement of the Luxor Obelisk in 1830s Paris was such a feat, the transportation process is inscribed in the Obelisk’s base. Unlike the Luxor Obelisk, whose ascension remains a vital aspect, Colburn intended to highlight the fall of the obelisk in the tipping yard, rather than place significance on the act of hoisting. In so doing, he subverted the expectations of an obelisk and literally and figuratively dismantled the, in his words, “seemingly static language” of the structure. With heavy machinery and a well-placed strap, the hollow obelisk quickly rose and stood, without support, on its base. Once raised, we briefly acknowledged its erect victory before Colburn and Dufala lassoed a florescent orange rope—that the artist bought especially for the demolition—around its width. Set starkly against the debris of the tipping field, the cloudy sky, and the plywood, the bold orange cord hung down loosely and was the only tool Colburn readied for the demolition process. Grabbing hold of the rope, Colburn pulled it taut, drawing a clear, sharp angle from the obelisk’s apex to his hands. With a quick tug, the obelisk fell, met the pavement of the tipping yard with a heavy thud, and emanated a deep slow bang. In a swift motion, the center section fell opened like an old oven door, stirring up a plume of dirt and exposing the skeletal armature of the obelisk. 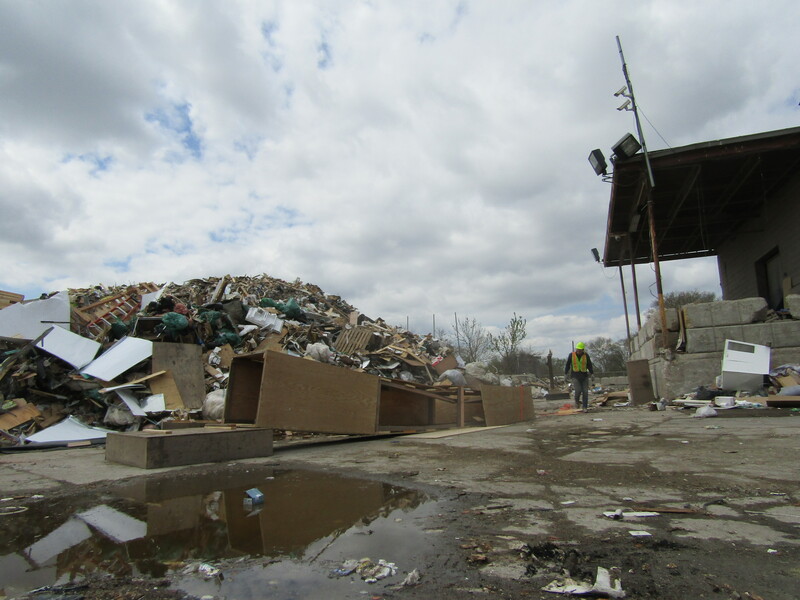 Having served its purpose of being hoisted for the sake of being toppled, its pieces were, Colburn noted, “ceremonially returned to the waste stream,” to the same piles that had supplied its materials and that had set the stage moments before. During a year when a national debate surrounding the removal of Confederate monuments ignited a deadly exchange, culminating in a white nationalist rally in Charlottesville, Virginia, Colburn’s consideration of destruction as an overt, perhaps necessary action draws into focus the magnitude of the racist, patriarchal history American monuments hold. The narratives they carry are resilient and may warrant a performative destructive end, one capable of dismantling an unquestioned sense of honor. Colburn’s demolition, though, was intentionally uncomplicated as it was generated by the artist’s hands. To focus on the toppling and the ease with which a quick yank can pull a relatively large-scale structure to the ground, destabilizes the power associated with memorial structures and shifts emphasis to a system that fosters veneration. It is not the monument nor the staged removal that remains problematic, but the ways in which we project meaning, acknowledge a shared sense of cultural heritage, and ignore troubling narratives. Power is not earned, necessarily; it is granted and, through acts like commemoration, remains intact. To argue that a monument is a part of history and therefore a viable public statement, is to discount the responsibility of the individual as the conduit of problematic meaning. In using a rope and his hands, Colburn animated a removal process that challenged the seemingly stoic nature of monuments. And, through the role of the artist, he placed emphasis on the practice of constructing historical narratives which are, ironically, as mutable as they are constant, as disposable as they are powerful. Lewis Colburn holds a BA in studio art and Russian language from St. Olaf College, and a MFA in sculpture from Syracuse University. Colburn’s work has been shown internationally and throughout the United States, at venues including the Pennsylvania Academy of the Fine Arts, Hallwalls Contemporary Arts Center, South China Normal University in Guangzhou, China, and the Torrance Art Museum in Los Angeles, CA. His works have been featured in Sculpture magazine, and the Philadelphia Inquirer. Colburn will be attending an Open Studio Fellowship at Franconia Sculpture Park in Minnesota this summer. He also has a solo exhibition at Penn State Abington Gallery in January and a project slated for NAPOLEON in April, 2019. Christa DiMarco is an associate professor at The University of the Arts (Philadelphia). Her primary research focuses on Vincent van Gogh’s two-year stay in Paris, and she investigates the rise of socialism, the art market, and material commodities that signify class. She holds a BFA in painting and drawing from the University of the Arts, and an MA and PhD in art history from Tyler School of Art, Temple University.